Palometa are laterally compressed fish with blunt snouts and small mouths, somewhat resembling piranha. 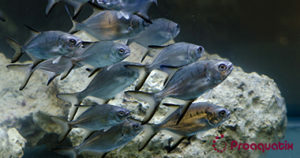 The fish are shiny and silver in color with dark yet faint vertical stripes along their body. Palometa have long ventral and dorsal fins. Occasionally, some Florida pompano have orange pigments on their fin tips and underside. Florida pompano are active swimmers because they have no swim bladder and therefore rely on hydrodynamic lift to maintain position in the water column. Palometa are primarily a carnivore of small fish, small mollusks, and crustaceans. Naturally forms schools. Juveniles are often found near beaches and in the surf while adults can be seen in a variety of habitats including open ocean, reefs, and beaches. The natural range of the Palometa spans from most of Brazil as far north as the Mid Atlantic North American Coast, but they are most common in the Caribbean. Although abundant in select parts of the Caribbean, in general the Palometa is a rare fish.